WE NEED Models for this style WIN Cheer hair bucks. This hairpiece is described as a full bun cover. 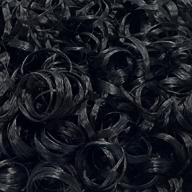 Its hair fiber is 7 inches long pulled, however its curl style makes it a bun of curls. The netting size is the 5 inches round pocketed. It attaches with 2 flexible flat combs and draw string with a locking stopper. This piece is the same curl as the Teen Original style which is 10 inches long. This is a stiff curl hairpiece for heavy use. The suggested age limit on the youth is 12 years old. This style comes in all 29 colors on the ( color ring ). Click on any picture for enlargement. Always read our policy section before placing an order with us!